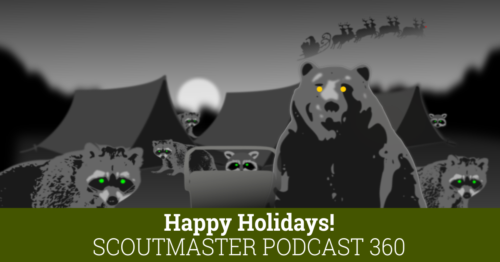 You are here: Home / Scoutmaster Podcast / Podcast 360 – Happy Holidays! Podcast 360 – Happy Holidays! Thank you for being a Scouter! Today I have a short story to share (with apologies to Clement Clarke Moore) I first read on Podcast 248 to wish readers and listeners happy holidays. The story includes Scouters in neckerchiefs, silence imploring, settling ourselves for a long winter’s snoring. Next week is Christmas and the following is new year’s, so for the next two weeks the podcast will be on vacation right along with you as you enjoy the holidays with your friends and family . I’ll return early next year with a new series of podcasts on the fundamentals of Scouting. [00:25] Dan Dinkin, Scoutmaster of Troop 95, Baltimore Area Council, shared this story with me.